Area:Land 541 km². Freshwater 0 km². Exclusive economic zone 218, 000 km². Terrain: Volcanic origin, surrounded by coral reef, relatively flat coralline limestone plateau (source of most fresh water), with steep coastal cliffs and narrow coastal plains in north, lowrising hills in centre, mountains in south. Climate: Tropical maritime, generally warm and humid, moderated by northeast trade winds. Dry season from January to June, rainy season from July to December. Little seasonal temperature variation. Geography: Largest and southernmost island in the Mariana Islands archipelago. Strategic location in western North Pacific Ocean. Economy: Industries include the US military, tourism, construction, transshipment services, concrete products, printing and publishing, food processing, textiles. Exports are mostly transshipments of refined petroleum products, construction materials, fish, food and beverage products. In 1982, Guam completed its Aquaculture Development Plan. The plan included consultation on 1) Historical and potential development, 2) Institutional organisation 3) Development strategy and 4) Implementation strategy. Economic benefits from the aquaculture industry were also documented. Research work on the seaweed Gracilaria edulis and G. arcuata were carried out by the University of Guam looking at ammonium uptake in different culture conditions. G. edulis was a popular salad and vegetable item. G. edulis from Guam was reported to have high agar yields in 1983. Freshwater eel (A. japonicus) was introduced and cultured initially by the Government of Guam. This was discontinued only to be carried on by a private company, Guam Marine Products, Inc. A. rostrata was introduced but was not a suitable species for cultivation in comparison to A. japonicus. Production was exported to Japan, as the local market was limited. The Government of Guam introduced milkfish (Chanos chanos) from the Philippines for a small-scale culture operation. Problems with supply of fry were encountered when the Philippines enforced a moratorium on export of milkfish fry. The Division of Aquatic and Wildlife Resources introduced the Pacific oyster (Crassostrea gigas) for culture trials. This was not successful due to a general lack of productive areas in Guam although one site Apra Harbour was considered for culture. The giant freshwater shrimp (Macrobrachium rosenbergii) was introduced from Hawaii. Successful culture demonstrated its significance for further development. Imports of post-larvae posed a problem. The government sought funds to develop a hatchery for local production. Commercial farms were in operation with the assistance of the government and the University of Guam. The giant tiger prawn (Penaeus monodon) was introduced to Guam from Taiwan and was cultured as a small-scale activity. Tilapia (Oreochromis mosssambicus) was introduced in 1954 for culture purposes from the Philippines. The first attempt at culturing was not successful. The reddish-orange hybrid of tilapia (O. mossambicus x O. niloticus) was introduced in 1974 from Taiwan and several culture trials led to commercial production. It is marketed locally as the "cherry snapper". Private entrepreneurs attempted culture of the soft-shelled turtle (Trionyx sinensis) from Taiwan. Culture practice was a small-scale activity. Several commercial farms were set up. Their products were marketed in Hawaii. Potential markets exist in Japan, Taiwan and the US West coast. Tilapia has been the mainstay product. Maximum production was 149,094 kg in 1993. 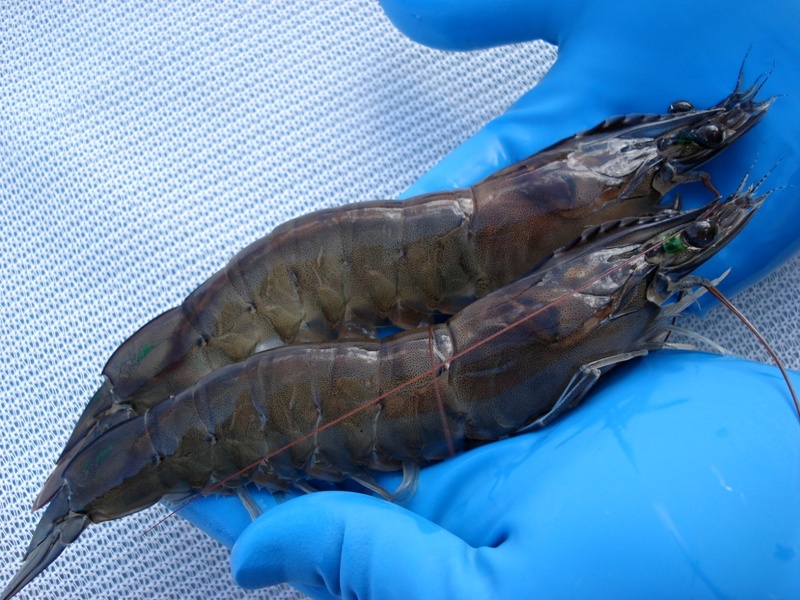 Marine prawn (Penaeus monodon) is the second largest product and is predicted to supersede production of tilapia.